The Large Sitting Bigfoot Stuffed Animal by Aurora is ready to relax and take a load off! it's not easy being the most elusive creature in the forest! It takes a lot of brisk walking, sneaking across roads late at night, and getting bad pictures taken of you constantly as you walk around the forest. Seriously, why doesn't anyone ever let Bigfoot pause and pose nicely for a picture? And forget about a video! This poor creature has been misrepresented by poor images and shaky-cam videos for too long. That's why this sitting Bigfoot stuffed animal is so important. The designers at Aurora sat down with Bigfoot and came up with this accurate representation to finally put to rest all of the speculation about Bigfoot's appearance. Bigfoot was involved in the process from step one and completely approves its plush likeness. 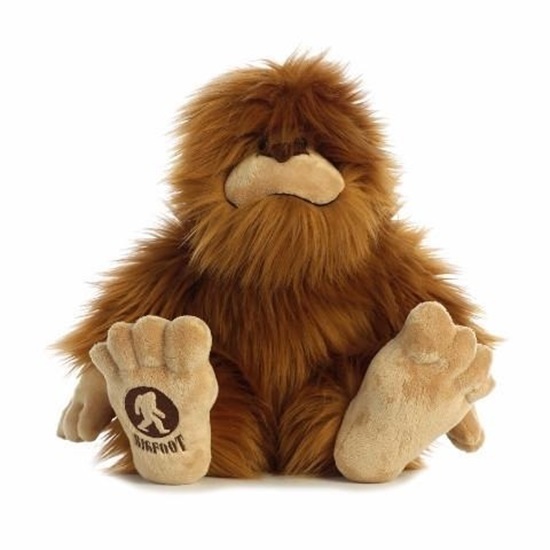 From the shaggy brown fur all the way down to the imprint of the popular Bigfoot logo on the foot, this plush animal is 100% Bigfoot approved. Now when you head out to the forest to look for Bigfoot you will at least know what you are looking for thanks to this awesome large stuffed Bigfoot. Bigfoot is perfect for ages 3 and up and is surface washable.